For its new beer release today, Level Beer will partner with a bar and arcade that both share similar branding. 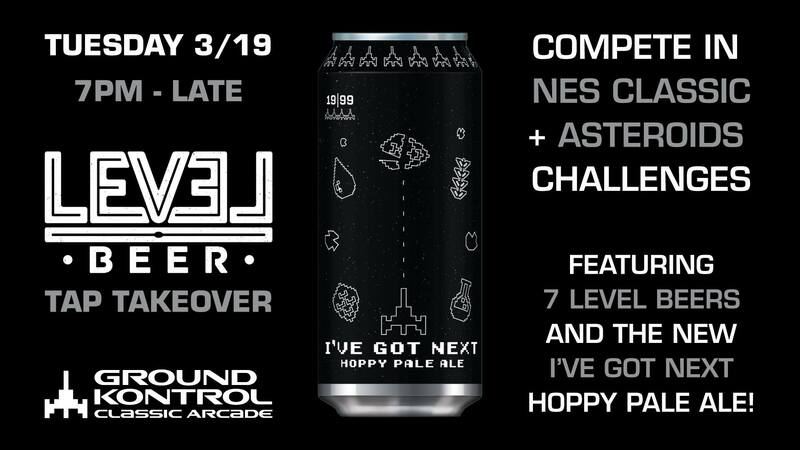 On March 19th from 7:00-11:00pm, Ground Kontrol Classic Arcade will host the official launch party of I’ve Got Next Hoppy Pale Ale as that arcade themed bar will pour a total of seven various beers from Level Beer. Inspired by Ground Kontrol, I’ve Got Next is a light-bodied, hoppy pale ale with bright citrus hop flavors and aromas all packaged in a 16oz tallboy can wrapped with arcade art. This new beer will be perfect to pair with any of the 150 games at Ground Kontrol. There’s more than just Level Beer tonight as Ground Kontrol will host special challenge events to allow you to earn prizes from both Level Beer and Ground Kontrol! Spin a wheel and try your hand at a random feat of Nintendo power in its NES Classic Edition Challenge, where you may have to best baddies in your briefs in Ghosts ‘n Goblins, dominate delinquent dudes in Double Dragon, or crush cursed corpses in Castlevania II: Simon’s Quest on Nintendo’s mini-console. Prefer a more old-school challenge, then enter the Asteroids High Score Challenge by playing the 1979 stand-up arcade classic, and submit your best score of the night for your chance at the top prize. In addition to I’ve Got Next, Ground Kontrol will be seriving up four Level Beer on tap plus, two beers in cans. Just make sure to bring enough quarters to keep your play continuing!